Founded in 1956, New Zealand-based Formway Design has been designing furniture for more than five decades. In 1979 the company redefined itself, developing a new identity and philosophy that focused on team-based design and extensive research. Formway’s designs are informed by insight gained through the observation and consideration of human behavior. Their user-centered approach marries a rigorous design process, an aesthetic sensitivity, and a passion for the environment. Knoll and Formway first collaborated on the highly successful Life® chair, introduced in 2002, which is celebrated for its sophisticated design, intuitive adjustments, responsive ergonomics, and sustainable attributes. 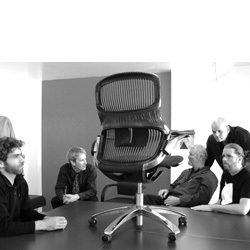 Building on these features, the two companies came together once again to develop the Generation chair, introduced in 2009. The progressive design features new materials and an elastic design that supports the physical and cognitive activities of the modern office worker. Inspired by Generation, MultiGeneration® extends the comfort and freedom of movement to the multipurpose seating category. Knoll and Formway’s most recent release, ReGeneration, aims to do “more with less” ― pairing down the form down without sacrificing key performance. It accomplishes this by minimizing materials and components while taking advantage of straightforward design to leverage flexible, durable, and even sustainable materials that respond to the user’s movements, providing comfort and support throughout the day.